Dr. Peter Manzer graduated in 1985 from McGill University’s School of Dentistry with a Doctorate of Dental Surgery. Dr. Manzer is a General Dentist serving Calgary’s NW community. In addition to general dentistry, he is trained to provide Sedation Dentistry to help alleviate the stress or anxiety patients may associate with dental work. 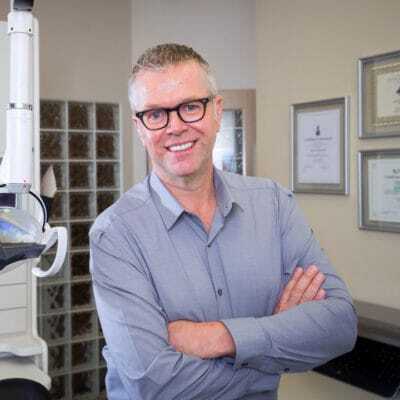 He finds it especially rewarding to be able to offer a dental sedation option that helps anxious or nervous patients, relax and receive the dental treatment they require. His goal is to make each dental visit as relaxing and comfortable as possible for his patients. Dr. Manzer also completed additional training in Cosmetic Dentistry and Implant Dentistry. His patients appreciate his meticulous attention to detail and commitment to providing the best dental care possible. In his spare time, Peter and his wife enjoy exploring all that Calgary has to offer. They especially like to discover new restaurants and visit the beautiful mountains that we call our backyard.